You certainly saw already a diagram more or less like this one. It is a standard way to explain what focal length is. This is how camera makers talk about focal length and they have a good reason for that: they want you to learn what focal length means in the context of their products, not necessarily in optics or photography. What are you missing if you take that as focal length? Well, if you do so, we can say that you are fully framed in your photographic mind. That means you won’t be able to understand other formats, other sensors or other film sizes nor what a lens really is. The right way to approach the subject is to see focal length in conjunction with other concept that is image circle. Those two, together with maximum aperture, are the three key parameters that describe a lens. 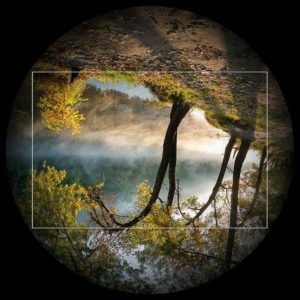 In this post we are going to look into focal length and image circle. You may have seen also a diagram like this one above. This is the one that better illustrates what focal length really is for a photographic lens. 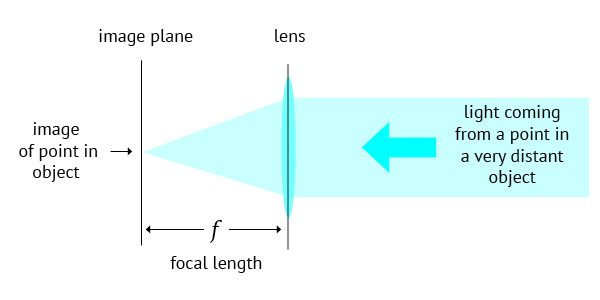 It can be enunciated like this: Focal length, in a photographic lens, is the axial distance between the optical centre of the lens and the formed image, when the object is far enough to be considered at an infinite distance. Confusing? It can become just intuitive. Let us work on it. Let us consider one little statuette as our object, and study the image that a photographic lens forms of one single spot on its forehead. We consider only one spot in order to make things simple and diagrams readable. But it works the same way for all parts of any scene or object. As you may know a photographic lens is a device with a certain light converging power. If that is not familiar to you, please read this very short post before hand: what is a photographic lens?. The animation below shows how this converging power works the light coming from that spot and reaching the lens surface. At the beginning, the observed spot is very close to the lens, so light diverging from it diverges so abruptly towards the lens that even applying its converging power the lens is not able to concentrate that light again and form an image of it over the film or digital sensor. We can see that it is converging but in a further point beyond the camera back. When the object begins to distance from lens, its light diverges less towards it. As a consequence, the lens, with its fixed converging power, starts to converge those rays closer and closer. When the spot is so far, out of the frame, that we can’t tell anymore whether light rays coming from it are divergent or parallel, the converging power of the lens is just enough to make all the light it captures, coming from that spot, to converge to another spot, precisely over its film or digital sensor. That is exactly the situation described in the focal length definition. We may say then that the distance between lens and image is the lens’ focal length, normally represented by the letter f.
When the statuette comes back, the same starting situation is likely to present again. The converging power remaining the same, it will send image to a place beyond the camera back. But this time, lens advances and makes up for the proximity of object and forms an image of the white spot right on where it belongs: over film or digital sensor. That is the basic way by which lenses are able to focus objects which are not as far as to be considered at infinite distance. Either lens advances towards object or film retreats, or both. As we can see now, focus length is a figure, a very important parameter of a lens, which in first place has nothing to do with the angle it embraces. What a lens intrinsically has, according to its construction, is a focal length and an angle of view which are independent one to another. 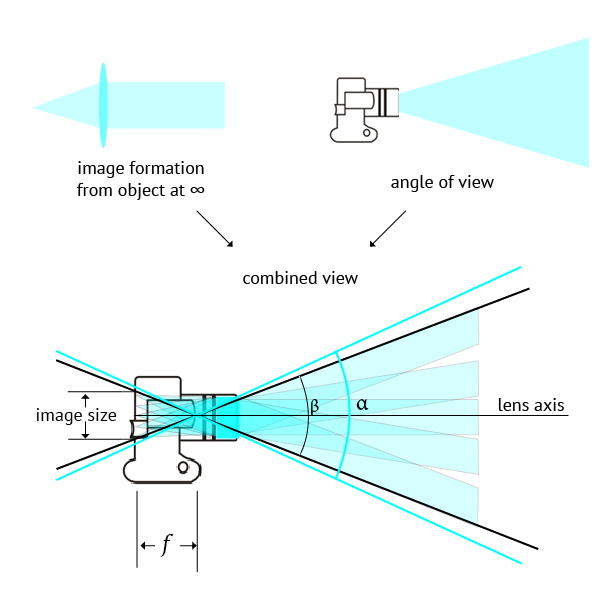 The angle of view is determined by lens construction and design. When it is more than 60º or so, we call it wide angle lens. In former times they were developed specially aiming for landscape photography. When it is less than 30º or so, we call it a narrow angle lens and historically were a pursuit of those thinking in portraiture. For a given focal length the angle of view will determine what we call lens image circle. 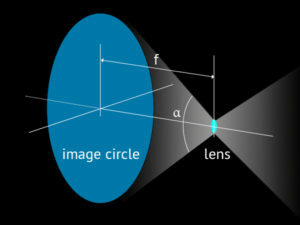 It is easy to note that once f and α are set the lens image circle is also fixed. Famous wide angle lenses throughout the history, like the Pantoskop, from Emil Busch (1820-1888), covered 80º and the same design was manufactured in seven different sizes, going from 52 to 540 mm in focal length (source Kingslake). 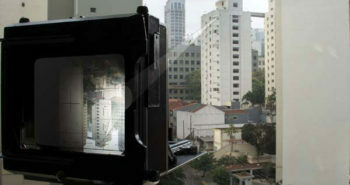 Above we have a typical image projected by a photographic lens. It is a circle and the white frame represents what the camera can use of it if an image with a 3:2 ratio is desired. The corners of the frame are almost touching the limits of that circle. A camera maker can use instead a smaller portion of it making the film or digital sensor smaller than image circle. That will be the case if the camera design allows lens shifts and tilts, otherwise it will be just a waste. That is the case in field cameras and also in modern lenses for full-frame or aps-c digital sensors when the lens itself incorporates the possibility of those shifts and tilts. One remark about telephoto lenses: What we call telephoto lens is a special type of lens that is physically shorter than its focal length. That means, a 300 mm telephoto lens does not need to be 300 mm away from film or digital sensor and its optical centre is in fact in front and outside the lens. 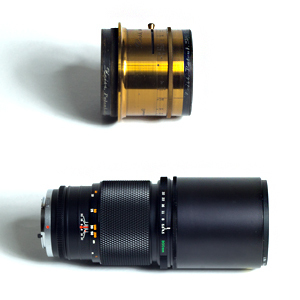 The Zeiss Protar from Ross and the Olympus Zuiko telephoto lens, on the left, are both 300 mm. The first one covers an angle of 70º and the second 8º. First one is a wide angle 300 mm and the second a telephoto lens 300 mm. What does that mean? It means that the Protar design allows us to fit that lens in a camera using a film 180 x 240 mm (we normally call that 18 x 24 cm) and yet leave room for generous shifts and tilts, because its image circle has a diameter of 42 cm when focused at infinity, far more than the diagonal of a 18 x 24 cm rectangle demands – that is 30 cm. More than what is needed to have a decent image over a 18 x 24 cm. Said yet in another way, there is as surplus of image that is not used by a camera/film with that size. 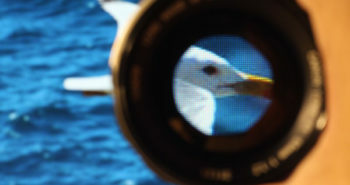 The telephoto Zuiko-Olympus is also a 300 mm, but its image circle is just enough to cover an image of 24 x 36 mm. Image circle diameter is certainly close to 50 mm, that is the diagonal for a 24 x 36 mm rectangle. At this point it should be understandable that the first two diagrams shown at the opening of this post, are not in conflict. We can conciliate them if we consider this: This is not a technical drawing, no formulas were used – it is rather an illustration. What it shows is that the diagram with camera angle of view is like many overlapping diagrams with image formation for distant object points. What we are calling here camera angle of view β is smaller than the lens angle of view α. This is to ensure that film or digital sensor fit into lens image circle and no vignetting will occur. It is slightly smaller for cameras with no movements and fairly smaller in cameras that allow for lens and/or back movements. If you understand that, then you know what focal length really is independently from brands or formats. The same reasoning applies to full frame or APS-C digital sensors. While the former is 24 x 36 mm in size, the latter is 16.7 x 25.1 mm. The lenses designed for full frame have more image circle than what is needed for an APS-C digital sensor, while the reciprocal does not apply. A full frame lens will work in APS-C but not the contrary. If one manages to fit a lens designed for APS-C in a a full frame camera, there will be a vignetting effect producing dark corners on the image. Why lenses are not made to be always plenty of coverage and image circle? 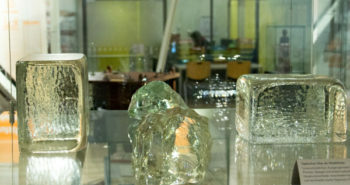 Given a certain focal length and intended image quality, production costs grow with image circle. As said before, wide angle lenses are the tricky ones to make. For this reason camera makers do not design lenses that will cover more than what is necessary according to the digital sensor format camera uses. Besides being useless and more expensive, it would demand to implement barriers and means to avoid that unused light to reach the image in an uncontrolled way, through internal reflexions, and deteriorate image quality. With the introduction of medium format digital sensors, like the one in the Hasselblad H5D-200c having a 50MP 43.8 x 32.9mm CMOS Sensor, and also digital backs for film cameras, the real nature of focal length and image circle must be considered if one doesn’t want to be confused about what a lens can deliver. Camera makers don’t like any promiscuity among brands, bodies and lenses, the bayonet mount is their standard barrier to avoid it. But throughout the history of photography exactly that possibility of mixing film formats and lenses has been part of the fun, creativity and mystery of the medium. 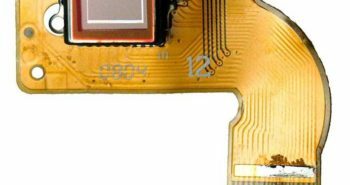 So let us look forward for the day when digital photography will produce sensors with sizes and prices allowing photographers to use simple lens boards and fit in them whatever lenses they feel like. 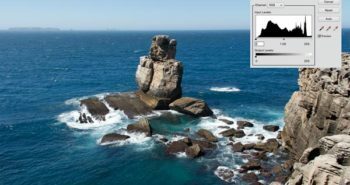 What is a histogram in photography? What is a photographic lens?